Mary: What is the idea behind Free Library of Pride? Marianne: Both New York Public Library and the D.C. Public Library have offered LGBTQ+ programs for June Pride Month at their libraries. I thought Philly could do it, too. Sara: Philadelphia rejoices in a vibrant queer community—it’s time for us to connect our LGBTQIA+ folks and allies with the wealth of resources and programming available to them through the Free Library. It’s also a chance for queer and ally staff to express pride in our identities and our beliefs. Mary: What is the main purpose of this event? Marianne: One purpose is to make people who happen to be LGBTQ+ feel welcome in their public library. Sara: We also hope to raise awareness in the wider community about the contributions and positive influence that LGBTQIA+ individuals, businesses, and organizations, bring daily to our lives. Mary: How have you motivated the collaboration of your fellow librarian colleagues? Marianne: The librarians of the Free Library need no motivation. We invited librarians to join us and many immediately said yes, of course, they’d do something. Sara: That’s right, it hasn’t taken much prompting. We offered them a few brainstormed ideas and arranged for combined publicity for all programs, and staff members throughout the Free Library have taken off running with a huge variety of program concepts. Mary: What type of programs will be featured in this citywide event? Marianne: Talks on everything from gay archives to breast health, with information for teens and adults. Game nights, storytimes, movies, LGBTQ+ poetry and read-alouds. A possible LGBTQ+ artists retrospective. A program for LGBTQ+ business owners and entrepreneurs, pop-up music concerts, and more. Sara: I’m simply amazed at the wide variety of events. Some particular favorites: a board game gathering entitled "Get Your Gayme On’…we supply the games, you bring the Fabulous!”, #WERQURVOICE, a presentation of podcasts about problems LGBTQ+ youth face, and an all-ages session of an ongoing LGBTQ+ poetry series. Mary: How many neighborhood libraries will be participating in this event? Marianne: So far 30 and counting Free Library locations have said they’ll join us—departments at Parkway Central Library, our Regional Libraries, and neighborhood libraries throughout the city. Sara: We’re hoping this is just the beginning—as June approaches, more Free Library agencies will probably hop on board. Mary: How will this event be funded? Marianne: There’s no separate funding but a lot of support from the Free Library, encouraging, organizing, and supporting us. We are also grateful to organizations such as Y-HEP (Youth Health Empowerment Project at Philadelphia Fight) and Linda Creed Breast Cancer.org, who are offering free programs at libraries throughout Philadelphia. Sara also quickly wrote a Strategic Initiatives funding proposal to pay for fun stuff such as her "LGBTQIA+ Multi-Age Storytime Traveling Trunk." Sara: Yes, we applied to Strategic Initiatives [A Hatchery for Innovation Proposal] and secured $2,000 in funds—but in fact, many of the libraries and departments are funding activities themselves. In other cases, presenters are offering their services pro bono or activities will make use of existing resources at the library’s disposal. It feels a bit like Stone Soup! Mary: What is the magic of the LGBTQIA+ Multi-Age Storytime Traveling Trunk? Sara: My idea was to piggyback on the success of the One Book, Every Young Child traveling trunks that have been used at various Free Library locations in recent years to enhance programming around a central book or theme. In our case, we’re hoping to pack the trunk full of good things to spark the imagination. It’s still taking shape, but expect things along the lines of fairy wings, a rainbow parachute, tiaras, a quality selection of picture books, music CDs, display materials, ideas for pre-teen and teen programming, and more. Mary: Why it is important to celebrate diversity? Marianne: I remember a passage from a Steinbeck novel I read years back. Our hero is about to kill himself. He then realizes that there is no community of light. Every person lights up the world. Steinbeck said it better but we have to celebrate diversity because every life has meaning, not just some lives. Sara: The United States is currently seeing severe cuts in funds for organizations and programming that serve vulnerable populations. Along with this has come a violent backlash against diverse social, cultural, economic and political expressions. Free Libray of Pride is an affirmation of human worth that celebrates not just queerness but the spirit of openness and community among all Philadelphians. Mary: How can the general public and community organizations participate in this collaborative effort? Marianne: I hope people will find something that interests them. I hope everyone will feel welcomed by their public library. Sara: As a librarian, I find it helpful when people let us know we’re meeting a need—or when they point out a need that hasn’t been met. We would really appreciate feedback on our programming, as well as on the materials we have available. We would love to work together with organizations and businesses that serve the LGBTQIA+ community not only in June but throughout the year. I encourage interested parties to approach us with your own ideas about potential collaborations. For a complete list of LGBTQIA+ programs and resources and the history of the Barbara Gittings LGBTQ Collection hosted at the Independence Library, please visit www.freelibrary.org/explore/topic/lgbtq or your local neighborhood library for additional information. 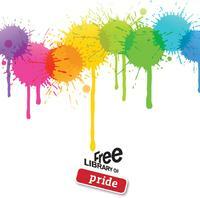 Add a Comment to Curious about the Free Library of Pride?